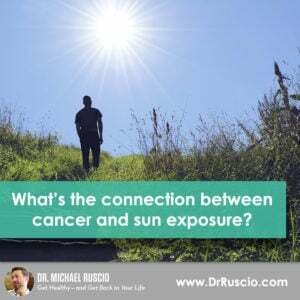 What’s the Connection Between Cancer and Sun Exposure? You are here: Home / Diet & Lifestyle / What’s the Connection Between Cancer and Sun Exposure? I look at studies that examine the connection between certain types of cancer and sun exposure and the results are surprising. The science helps clarify the connection between skin cancer, sun exposure, and chemical sunblocks. Sometimes in pursuit of improving health or preventing disease we may inadvertently do things that are counterproductive to our intention. A good example of this is skin cancer prevention. Many people try to lower their chances of skin cancer by slathering on chemical sunscreens or avoiding the sun altogether. But science gives us another perspective about what’s healthier. Let’s examine some evidence-based studies around the connection between cancer and sun exposure. While sun exposure may conjure thoughts of skin cancer first and foremost, there’s more to the discussion. We know that the incidence of cancer declines the closer you get to the equator, a region known for its extremely strong and plentiful sunshine. The theory behind this is that potent equatorial sun exposure also raises vitamin D levels, and vitamin D is one of the most important known regulators of strong immune function. A robust immune system is the best protection against developing any type of cancer. A recent epidemiological study has found that chronic, rather than intermittent, sun exposure is associated with reduced risk of developing certain types of cancers, particularly breast and colorectal cancers. The risk of these cancers goes down when vitamin D levels from sun exposure goes up. The surprising part of the study showed the risk of other types of cancers, such as prostate cancer and non-Hodgkin’s Lymphoma, were reduced simply from increased sun exposure irrespective of vitamin D levels. The study suggests that the sun confers beneficial, anti-carcinogenic properties in addition to that of vitamin D.
In order to get these benefits, sun exposure must be chronic, which means regular exposure of between 20 to 50 minutes of daily sun, based on skin color and tolerance. The take-home from this study is that protecting yourself excessively from the sun may be counterproductive. Rather, it’s healthier to get a minimal dose of daily sunshine, enough to slightly darken skin pigment to a pinker or browner shade, but not enough to burn. Also, exposing body parts that are typically not exposed to the sun, like the belly or low back, can boost vitamin D levels in a shorter time than tanning more exposed areas, like the hands or face. However, after skin darkens it’s a good idea to cover up. Skin cancer risk only increases through overexposure, which is characterized by sunburn. Reasonable and responsible sun exposure, which prevents sunburns, will likely also prevent skin cancer. Preemptively using chemical sunblock to prevent skin cancer is a strategy that can backfire. Lab researchers induce skin cancer in rats not by exposing them to UVA or UVB light or radiation found in sunlight, but rather by applying chemicals to their skin. Many of today’s conventional sunblocks contain chemicals that are probable or potential carcinogens. The toxins we put on our skin combined with general toxins found in the environment are much more likely to promote cancer growth than sun exposure. So next time you decide to sunbathe, be careful not to burn and enjoy the many health and stress-melting benefits of relaxing in the sun. This feels like a great start to an article, but it ended right when I thought we’d be getting to more solutions! I’m a very fair skinned person and do my best to find a balance with sun exposure. I’d like guidance to help me know what type of natural sunscreens are okay to use. Currently, I rock a lot of hats, sometimes cover with long sleeves, but mostly use natural sunscreen. What brands will be the kindest to my skin and body? I would cross reference a natural sunblock form a health food store in this database, http://www.ewg.org/skindeep/. Hope this helps!